Did you see a Black Audi in Huntingdon? Detectives investigating the murder of a man in Huntingdon have released images of a car they want to trace as divers search a pond in the town. The body of Sam Mechelewski, 20, was found by a member of the public at about 1pm on 1 February in a wooded area of Hinchingbrooke Country Park. Did you see this car? Officers are keen to speak to anyone who saw the vehicle, a black Audi A3, in Huntingdon in the evening of Wednesday last week (31 January). Specialist diving teams from the Metropolitan Police will be searching a pond near Woodlands and the edge of the park today (9 February). Yesterday CCTV images of Sam were released showing him at a branch of Sainsbury’s in St Germain Walk, Huntingdon, shortly before 8pm on 31 January. 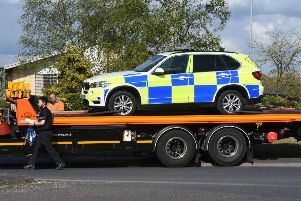 Detective Chief Inspector Adam Gallop said: “We’re appealing to anyone who saw this vehicle in the Huntingdon area to get in touch with us as a matter of urgency. It may have been parked by the side of the road. We need to get answers about who was in the vehicle and what they were doing in the area. Anyone with information regarding this incident should call police on 101 quoting CC-01022018-0198 or visit https://mipp.police.uk/operation/554. Alternatively, contact Crimestoppers, anonymously, on 0800 555111 or via www.crimestoppers-uk.org.